Although it featured a great ending, Against All Things Ending proved to be a disappointing novel and probably the weakest Thomas Covenant installment to date. Still, it left the door open for an exciting finale and I was really looking forward to discovering how Donaldson would close the show. Sadly, the final chapter in The Last Chronicles of Thomas Covenant suffers from the same shortcomings which made Against All Things Ending such a disappointment. In my review of the third volume, I pointed out that it seemed evident that Donaldson had four powerful endings planned. Which, I felt, was likely why he structured this series into a four-book sequence. Trouble is, I feared that he lacked the material to truly come up with four fully satisfying installments, and that this series could have worked better as a trilogy. Having reached the end of The Last Dark, I can now confirm that it's unfortunately the case. The last two volumes feature more filler than killer material. 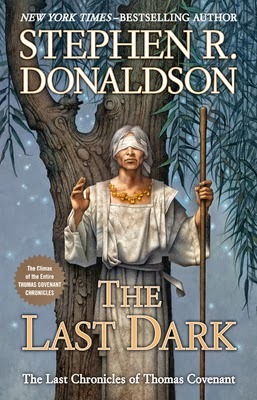 . .
Donaldson's narrative in every Covenant novel always conjures up vivid and magical images, and The Last Dark is no exception. I've said before that few speculative fiction authors can match Donaldson when it comes to creating an imagery that literally leaps off the page, and it's still true. Like the rest of this series, this final volume is vast in scope and vision. In terms of worldbuilding, The Last Dark answers many of the questions raised by all its predecessors. Revelations abound and it's nice to see everything come full circle in the end. Anyone familiar with Stephen R. Donaldson should be aware that nothing is ever easy with this author. Hence, don't expect everything to be peaches and cream, not when the Land lies on the brink of destruction. Now more than ever, the relationships between Linden Avery and Thomas Covenant and Jeremiah remain difficult, painful, and bittersweet. All three are POV protagonists in this novel, which creates an intriguing balance between the narratives. And since the three of them are emotionally a world away from each other, witnessing events and seeing the story progress through the eyes of such disparate people makes for an interesting reading experience. Though it's not as bad as in the third installment, the characterization sometimes leaves something to be desired. As always, revelations are made that will break Linden's heart, and she must find the strength within herself to persevere. Linden Avery has always been a flawed protagonist. In the past, it always made her more genuine. But in Against All Things Ending Donaldson clearly went overboard with the guilt, the self-loathing, and the painful emotions. In The Last Dark, Linden is once again a more "balanced" character. Another aspect of the characterization which put off some readers in the third volume was Covenant's passiveness. It was all due to the fact that his mind was broken, yet for the better part of the novel Thomas Covenant was little more than a plot device giving the rest of the cast something to react to. Not so in this one. For the better part of the book, Covenant is in the driver seat, trying his damnedest to prevent the end of the world and the death of all he holds dear. Given his harrowing past, it was nice to have the chance to enter Jeremiah's mind and see how he reacts to the world around him. The book's greatest shortcoming, and what literally kills it at times, is its snail pace. True, all Thomas Covenant installments have never been known for their crisp and fast-moving rhythm. Every Covenant book has suffered from a more sluggigh pace once in a while, so Donaldson fans have come to expect this. But Against All Things Ending suffered from extremely long and often boring portions that sort of put a damper on the few truly awesome sequences found in the book. The same goes for The Last Dark. Being the final volume in the series, as a matter of course several important story arcs are brought to resolution. For the most part, these are great and bring closure to plotlines introduced in all three Chronicles of Thomas Covenant. Problem is, one must endure a never-ending travelogue of over 300 pages during which, à la Sanderson in A Memory of Light, the cast must go through countless battles in order to reach the heart Mount Thunder. Such a high number of random fight sequences was so atypical for Donaldson and bored me in such a way that it very nearly killed the entire book for me. With about half of the novel wasted on the characters walking from point A to point B, or on recurrant battle scenes that bring little or nothing to the story other than filling more pages with meaningless blood and gore, I felt that it often robbed the important sequences of their rightful emotional impact. The grand finale, when it comes, offers a decidedly anti-climactic resolution to the series. I enjoyed it and liked how it ties everything up, while leaving the door open for future sequels. Having said that, The Last Dark failed to close the show the way The Power That Preserves and White Gold Wielder did in the first two Chronicles of Thomas Covenant. Considering the vast amount of filler material found in the two last installments, it is now obvious that this series would have worked a lot better as a trilogy. Although it was meant to be the most ambitious Chronicles of Thomas Covenant, Donaldson last series failed to live up to the potential generated by the first two trilogies. That's a shame. I've been saving the final series for a back-to-back read, since that's how I encountered the first two trilogies back in high school. I'll still give them a read - I can't imagine not - but with expectations safely lowered. Sounds like something where the pleasures may lie mostly below the surface rather than in lots of action, etc. so this still may please me. Glad you're keeping a high profile on Donaldson with reviews etc., the guy deserves it. Indeed, this book let me down. Too much with the lurker, too much exposition, and too little forward progress. I'm a staunch SRD defender/fan, but I'm having a hard time backing this one up.